Beautiful angels who walk among us. In an alternate reality of 2010, a high tech city named Neo-Acropolis is the setting. 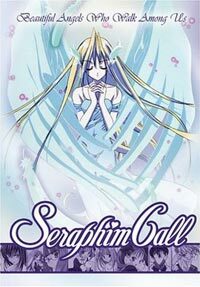 Seraphim Call follows a cast of 11 girls, each with her own separate story. What I had heard of Seraphim Call was overwhelmingly negative, with a hand full of supporters standing up for it. I expected something horrid, but found an interesting anime which is surprisingly daring in some ways. It is certainly not like your typical anime, so if you're expecting yet another formula title, this is not it. What makes Seraphim Call unique isn't the story, characters, or even the setting; it's the way the stories are told. Some episodes aren't anything special, but charming in their own way. (3) Taste of Cake, (9) Legend of a Girl, (12) Sacred Night of Seraphim. Where Seraphim Call really differs is in the experimental stuff. The stories vary in success, but even where the story struggles, the way it's told makes them worth seeing. (2) Margarine Crisis - Tanpopo has a vast collection of stuffed animals, and still talks to them despite being in her teens. One of her friends gets upset over this perceived immaturity and they have a fight over it. - This story is simplistic and very dull, however what makes it interesting is that the entire thing is viewed from the perspective of a stuffed animal. If it falls over, our perspective is sideways as well, etc. At this point I was at least willing to give Seraphim Call credit for doing something different, even if the story wasn't spectacular. (4) The Flying Angel - Hotsumi avoids nearly everything even remotely feminine, but is forced to face her problems when an artist wants to use her as a muse for a painting of an angel. - This is a story which would be pretty simplistic if told from beginning to end as expected. While the beginning and end are in the right spots, the middle is cut up and arranged completely out of order. This makes the story harder to follow, but much more interesting in presentation. (5) To my sister in my Dreams - Shion and Sakura are twin sisters who have always been together. One day a love letter arrives in the mail, but the recipient name is obscured by a burn mark. Who is it intended for? - This story follows twin sisters nearly indistinguishable aside from their voices, and eye shape. Shion is troubled by the letter, but wonders what Sakura thinks about it. Shion uses a virtual reality device which allows a person to enter a virtual world as someone else. She chooses to become her twin. Things get strange as she decides to have a talk with her virtual self as her sister. From this point things become harder to follow because it's no longer clear if she's still in the virtual world, or she is herself, the virtual one, or if she is acting as her sister. Needless to say this episode blew my mind. And then at the end the sisters aren't sure if they're in the real world, they decide to kiss to see if it's real. I'm like, "ok normally I'd expect them to pinch themselves, but that was kind of hot." (6) To my Sister Inside Love - I was still thinking about how crazy the last episode was, when episode 6 takes it a step farther by presenting the previous story again, but this time from the perspective of her sister. Much is identical, but with subtle differences. 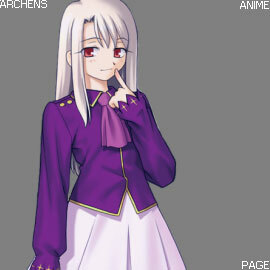 Sakura, like her sister; has a virtual reality device, and also decides to become her sister to try to better understand her. These two episodes are amazing for many reasons, but I most enjoyed the duality aspect. Identical twins look the same, but are not the same person - just like the episodes look the same, but are also different. You can watch these episodes multiple times and probably never catch all the oddities... Then again if you watched them twice in a row your head might explode. If you're into crazy cerebral stuff, these two episodes are amazing. (10) Real Blue - Kurumi is a high school girl who unknown to her friends and family is a manga artist. Her latest work involves a girl and boy who end up living together, but then the teenage son of a friend ends up staying at her house in real life. Reality turns out quite different. - Nothing unusual about this one. It's just a cute story dealing with perspective. (11) The Inner World of Me - Urara still feels attached to her father who died years before. - The interesting thing about this story is that Urara is the ONLY character shown. No one else is shown or heard, only Urara's replies and reactions. While this sounds like a disaster, I thought it worked well and was cool to watch. It bungles the effect with a crappy ending, but was interesting all the same. The character designs stay true to the artwork of Aoi Nanase, and the results are fairly attractive. Musically the intro is the standard fair, with each end theme sung by the voice actress for the main character of that episode. An interesting touch. Individual episodes are hit and miss, but I think it's a net positive. The strength in unusual storytelling is not something commonly done in anime, which is why I think this one gets a bad rap. Don't confuse storytelling with plot. While Seraphim Call has only decent stories, the way they are told with artistic flare makes some of them exceptional. 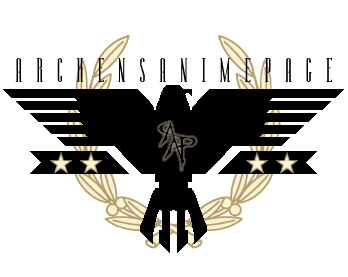 Seraphim Call is probably best suited to those with an appreciation for art (in film), as it's not a check your brain at the door anime - yet not very deep either. Seripham Call is among the gutsiest shows I could name. I really enjoyed (some of) it, but it's you're call if it's something you'd want to watch. Shion: For example the author who created this very world.